I'm extremely finicky about mascaras. For me to even give one a second try, it must be thick, inky black, buildable, both lengthening and thickening, non-clumpy, and not too "wet." I've been disappointed by mascaras so many times that I've grown very wary of the outrageous claims often made in the marketing copy...so when I saw the words "24-hour mascara" I scoffed. But what kind of beauty addict would I be if I didn't give it a whirl? So I decided to give the mascara in question, Prescriptives Here to Stay 24-Hour Longwear Mascara, a thorough test drive. First, the brush. Here to Stay's brush is one of those newfangled flexible comb jobs, which I really like. They tend to distribute product evenly and somehow prevent clumping. Plus, the wand is super flexible, so there's less risk of poking yourself straight in the eye on groggy mornings. Here to Stay is thick without being lumpy; I applied several coats on top of one another without my lashes sticking together or clumping. With a few coats I was able to achieve the massive lashes that I love so dearly. I put this mascara on at 7 am on a Monday and decided to wear it all day and then sleep in it, no touchups, no makeup remover, no cheating. Imagine how surprised my cynical little self was when I awoke the next morning at 6 am to find it still intact, with no "sprinkles" on my cheeks, raccoon eyes, or other signs of wear-off. It indeed lasted 24 hours! (OK so that's 23 hours, but who's counting?). Removal was a bit tough, though I attribute this to the fact that I just HAD to use 10 coats of the stuff in the first place. If you're a normal person and use one or two, removal with a good eye makeup remover should be just fine. 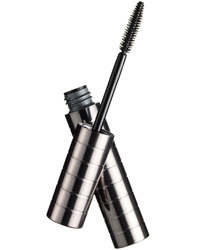 Now, I don't always need my mascara to last 24 hours, and I don't always need it to be waterproof, either, so I'm saving this one for endless workdays, weddings, tearjerker movies, and long haul flights. Come to think of it, with Here to Stay you could probably do the workday, the wedding, the movie, and the long haul flight consecutively and still have perfectly defined lashes!